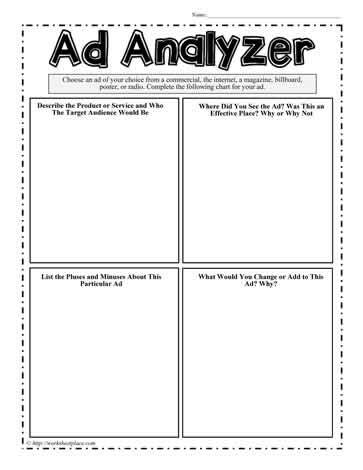 For the ad analyzer worksheet you choose an ad of your choice from a commercial, the internet, a magazine, billboard, poster, or radio. Complete the following chart for your ad. Describe the Product or Service and Who The Target Audience Would Be. Where Did You See the Ad? Was This an Effective Place? Why or Why Not. List the Pluses and Minuses About This Particular Ad. What Would You Change or Add to This Ad? Why?